The technology pers-media is often using "2 person as a couple" stereotype in describing who's founder of tech company. We should know Bill Gates-Paul Allen, Jerry Yang-David Filo, and Larry Page-Sergey Brin. At very least pers coverage internet hits founder like Mark Zuckerberg or Kevin Rose. So when Jawed Karim -now 29 years old- is come out and known as one of biggest stock holder in Youtube when people already familiar with "dynamic duo" Chad Hurley and Steve Chen, it sound uncommon. YouTube says Karim was part of the "core" team that developed the idea for the company and notes that he is listed as one of three founders on its website. Karim is one of the company's biggest stockholders and Karim received 137,443 shares of stock, worth about $64 million as of Google's accuisittion. Who is Jawed Karim ? Karim was born in Merseburg, East Germany, in 1979 and moved to West Germany in 1980. His family immigrated to Minnesota when Karim started high school. His Bangladeshi father is a chemist at 3M, and his German mother is a biochemistry research professor at the University of Minnesota. He left campus prior to graduating to become an early employee at PayPal, but continued his coursework, earning his bachelor's degree in computer science and engineering in 2004 at the University of Illinois at Urbana-Champaign in 2004. Hurley, Chen, and Karim met as early employees at PayPal, the payment service sold to eBay in 2002. The three, newly rich after leaving PayPal, talked about a start-up of their own, possibly a database venture, Karim says. Then, early last year, Karim recalled the difficulty involved in finding and watching videos online of Jackson accidentally baring her breast during the Super Bowl show. The same was true with the many amateur videos made of that winter's devastating tsunami. Karim says he proposed to Hurley and Chen that they create a video-sharing site. "I thought it was a good idea," Karim says. The three agreed within a few days in February, then divided work based on skills: Hurley designed the site's interface and logo. Chen and Karim split technical duties making the site work. They later divided management responsibilities, based on strengths and interests: Hurley became CEO; Chen, chief technology officer. Karim had already planned to resume computer studies, so he opted out of management and agreed to take a smaller ownership stake than the other two founders. He continued advising YouTube and a growing number of employees — now 67 — as Hurley and Chen took his "little spark" of an idea and turned it into a fire. "My only interest was in helping the company get off the ground, implementing it, and raising money," he says. Hurley and Chen then handled the Google talks; Karim says he signed off on the deal once details were reached. Now in a two-year master's program, Karim says he's considering another start-up but declines to give details. For now, Jawed has launched a venture fund called Youniversity Ventures, with the goal of helping current and former university students to launch their business ideas. Karim describes himself as "one of the biggest YouTube fans in the world." "I spend hours some days watching it," he said. "I've probably watched more videos than just about anybody - I'm really a YouTube power user." To hear Karim tell it, there's no magic in his method. "It's very simple: I basically create things that I need myself," Karim said in an interview. "It just so happens that sometimes other people want to use that." c. It makes you become a humble person. Randy Adams serves as the CEO of Searchme, Inc., a visual search company initially funded by Sequoia Capital. Randy co-founded Searchme after acting variously as founder, chairman, CEO and president of seven high technology and retail corporations over a 25-year period. Early on, Randy was a principal at Booz Allen, and then acted as Director of Engineering for Adobe, where he helped conceive the Acrobat and PDF formats. He then secured initial venture funding for Yahoo!, Inc. and served on the Yahoo! Board of Directors during its first year of operation. Randy went on to found the Internet Shopping Network, the first Internet Shopping site, and later originated the eBay drop-off store concept with AuctionDrop, Inc. Randy also co-founded the popular comedy video site, Will Ferrell's funnyordie.com, and currently serves as a director on the company's board. He is a graduate of Massachusetts Institute of Technology, and received his B.S. in Electrical Engineering. Adams lives in Menlo Park with his wife, Nicole and their 7 children. Began his career as a radio news director at a small station in Ohio, Ron Jackson now known well as Editor and Publisher at DN Journal Sites, a sites dedicated for fascinating Domain Name Industry. A industry that everybody can joint and have very little barrier for new comer just like you and me, to hit profit just with little skill and everybody good at : word game. If you can play scrabble, then this "game" is just perfect-right for you. Think a word that popular or easy to remember, then you've done. Off course with little luck, a new comer can easily get $100 per transaction, just flipping a name that he bought the other day. From Ohio, Ron Jackson moved on to television as a news reporter with an ABC-TV affiliate in Florida. Two years after arriving there he became the station’s Sports Director. Later he moved on to a Top 20 market, doing sports for the CBS-TV station in Tampa. After 20 years in radio/TV he start his own business and opened a series of record stores, an antique shop and various internet ventures. He bought his first domain name in 1997 and put his first site online named musicparadise.com. In early 2002 he was looking for additional names for his internet projects when he found this DN business. 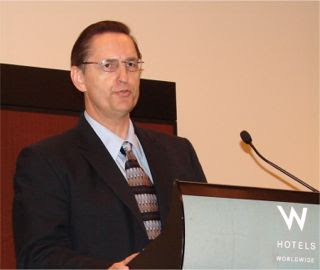 Now Ron Jackson is President of Internet Edge, Inc., a web publishing company founded in 2000. Thought many critics about domain business say as "word gamble" industry, but still, for newbie, Ron's Journal is one of the first resources to considered about, for everybody want's to jump is this games. With a series of sites dedicated for domain name business, Ron Jackson has a unique "brand" as Domain Names Games Master. He shaped internet industry with his weekly report for "hit" price in domain name transfer accros the internet. You could take a look the report at here. This is just our opinion that even the report is collecting data from well known auction site like SEDO, Moniker, etc, but we have to preserved ourselfes a cool mind. Because it's really interesting huge profit for a domain bought at $10, sold at $250.000, but there's no written prove that we can confirm. That kind of transaction happen in closed door and never exposed originally. We can only look at auction board, but no chances to check it wether it's right or just a buzz. We think that a profit value between $100 and $ 1000 is natural, if we take look at Kevin Rose's digg.com story when he bought his famous digg.com at $1200 after he rejected by digdig.com's owner at $500. This is true story from Kevin Rose. So if you think a new business and you like scrabble, you may test your luck in domain business, but don't push it to much. Windfall profit in six digit is rarely happen if not a fake story...don't forget to read Ron Jackson site and get all help you need there. "The growth of New Media journalism will be a hybrid combining the best aspects of traditional print newspapers with the best of what the Web brings to the table. We're getting a glimpse into this with the many changes afoot at Old Media places like the The New York Times, and from New Media players like, well, like the Huffington Post. The online vs. print debate is totally obsolete. It's as musty as the old barroom argument about Ginger vs. Mary Ann. It's 2008, why not have a three-way? Traditional media have ADD: They are far too quick to drop a story. Online journalists, meanwhile, tend to have OCD—we chomp down on a story, refusing to move on until we've gotten down to the marrow. The shifting dynamic between the forces of print and online reminds me of Sarah Connor and the T-101 in The Terminator. At first, the visitor from the future (digital) seemed intent on killing Sarah (print). But as the relationship progressed, the Terminator became Sarah and her son's one hope for salvation. Today, you can almost hear digital media (which for some reason has a thick Austrian accent) saying to print: "Come with me if you want to live!" When first starting Huffington Post at 2005, 3 years ago, many critics on her idea mentioned as a digital meeting for her old politics friends to gather new liberal friend. But Huffington Post has grown in ways that few, except perhaps Ms. Huffington herself, expected. Today, The Huffington Post has become one of the most popular and widely quoted sites on the web, its influence easily rivaling that of many mainstream media. But who's Arianna Huffington ? Born native of Greece, she has been the president of the debating society in University of Cambridge. An author of books about feminism, Picasso and green movement, a panelist on radio and television shows, a millionaire, and she is also a candidate in the 2003 California governor election. A native Indonesian that newly graduated from her university. 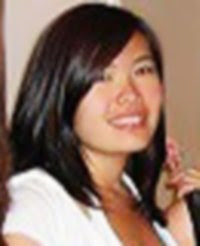 She is a recently graduated from Computer Science UCLA. But her work is way beyond her tittle..
At http://melissahie.com/, she design, what I thought as a big floor, and we can travel from tile to tile, amazing slide effect and combination of artistic art image with perfect color blend. Yet it still a simple web site, which demonstration about her skill with css and mootols framework. "random things about me: I'm a nerd. I like sci-fi shows like Battlestar Galactica. I've been a decade-long HUGE fan of The X-Files. I also love love love (did she said love?) House MD. I watch a lot of TV shows if you can't already tell =). I like Video Games and webdesigning. I do NOT like shrimp. I drink green tea like it's water. I LOVE dogs and bunnies! I have a thing for hardwood floors and black nail polish. I'm a fob. I'm VERY gifted at finding cute clothes for really cheap ;D. I'm also quiet, but if you talk to me I will be nice!" What new about her works I think is a new approach in site design that thinking a site is not just your monitor width but trully wider than that. And loading this site is not take any longer than flash loading..because she only use color blend to match image blend. 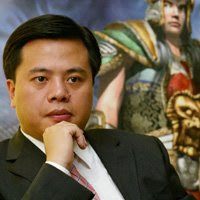 we can deliver 3D effect as well..this could be a masterpiece..
Chen Tianqiao, the co founder, chairman, and CEO of Shanghai Shanda Interactive Entertainment Ltd. Chen, 36, runs China's most successful Internet gaming company, an operator that raised $150 million in an initial public offering 2004 and then became the best performing stock on the NASDAQ. Shanda business model is count as pioner in distributing prepaid-card in China. This make Shanda easily earn their income from addicted online gamers. Millions of Chinese spend hours and hours playing the games Chen supplies. One of Shanda's top games, a fantasy adventure called The World of Legend, attract as many as half a million users playing simultaneously. Shanda earned $74 million last year on sales of $157 million, and analyst expect profits to top $100 million on 2005. At $2.6 billion, Shanda's market capitalization is the biggest of any Chinese Internet company. Yet after a successful 2004 offering his company, Shanda Interactive Entertainment, which he founded and owns with his younger brother Chen Danian and his wife, Luo Qianqian, has lost some stream because of imitators. To overcome this, Shanda early 2005 bought a 19.5% stake in Internet portal Sina to boost its presence beyond online gaming. Andy Bectolsheim was born in Germany in 1955. He received his master's degree in electrical engineering from Carnegie Mellon Universty in 1976 and was a PhD student in EE/CS at Stanford University from 1977 to 1982. After co-founded Sun Microsystems (became a success, with $1 billion in sales by 1988). By 2003, the market value of Sun Microsystems was $11.5 billion, he left Sun in 1995 to found Granite Systems, a company focused on developing high-speed network switches. In 1996, Cisco System acquired the firm for $220 million, with Bechtolsheim owning 60%. 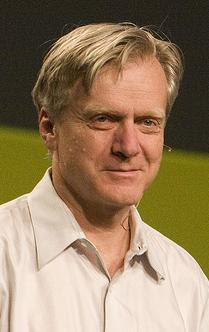 He became Vice President and general manager of Cisco's Gigabit Systems Business Unit, until leaving the company in December 2003 to head Kealia, Inc.
Bechtolsheim and Cheriton were two of the first investors in Google investing $100,000 in 1998. Bechtolsheim reportedly wrote the check to Google Inc prior to the company even being founded. What he did is come to Google Demonstration, play with it a little, and then without written contract, he wrote a check and gone with his porche away. Without even knowing how Google Guys will establish Google. Bechtolsheim seeded many companies in this fashion, including OnFiber Communications, the industry leader in metro transport for large enterprises (acquired by Qwest in 2006). As a result of investments like these, Bechtolsheim is increasingly being seen as the most successful Angel investor, one such company, Magma Design Inc., has been tremendously profitable for Bechtolsheim, with his stake in the company being valued around $60 million. The most profitable for Bechtolsheim was his initial $100,000 investment in Google, which is now worth approximately US$1.5 billion. Do you think Cyworld is a Korean MySpace ? That's could be not true, since MySpace is an American Cyworld. In South Korea, an estimated 25 percent of the population (and 90 percent of people in their teens and twenties) have Cyworld accounts, where individuals design miniature animated avatars to represent them in its unique online space. 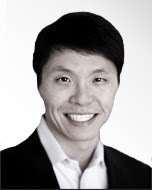 In 2006 CEO Henry Chon brought Cyworld to U.S. shores. Though Cyworld hasn't yet achieved comparable success here, MySpace shouldn't rest easy if Chon's track record is any indication of future competition. Cyworld's per capita penetration in South Korea greater than MySpace in the United States. Cyworld isn't a game, although it's cute avatars and 3-D rooms may make it look like one. It's a kind of social network - 'cy' is Korean for "relationship". And what it's make more interesting is that its business plan is unique. The bulk of Cyworld revenue comes from the sale of virtual items worth nearly $300,000 a day, or more than $7 per user per year. By comparison, ad-heavy MySpace makes an estimated $2.17 per user per year. As Cyworld gathered a critical mass of users, it discovered a new business model. Using the site was free; personalizing it was not. If you wanted to decorate your mini-homepage, you could choose from tens of thousands of digital items - homepage skins, background music, pixelated furniture, virtual appliances. But you had to pay for them with "dotori," or acorns, and you had to buy the acorns with real money. The virtual goods were cheap - typically less than $1 apiece - and consumers had no problem paying for them. A well-appointed mini-homepage reflected your social standing, and users who did not decorate were considered boring. This year Cyworld expects to make $140 million in sales, with acorns accounting for 70 percent of that. That means Korean consumers will shell out more than $100 million this year for Cyworld's virtual inventory. Most of the rest its sales comes from mobile services, where customers pay to upload photos (90 percent of all images uploaded in Korea go to Cyworld). Cyworld is exporting its service to the U.S. through a barebones office above a Quizno's in San Francisco and $10 million in funding, part of which is going to adapt Cyworld's sensibility to the United States. Cyworld U.S. CEO Henry Chon is the first to admit that the Korean site is "a little too cutesy" for American tastes. "The thing we'd like to retain is how the service is based on your real identity," he says. By linking the identities of new members to their mobile-phone numbers at sign-up, Chon hopes to keep a lid on anonymous accounts - and the exhibitionism that can scare advertisers away. The U.S. version will launch in mid-August with mini-homepages and a digital store. Where MySpace is as chaotic as a million teenage bedrooms, Cyworld's U.S. version is organized but customizable. Each mini-homepage offers the same tabs (profile, mini-homepage, photos, journal, guest book, sketches, and bookmarks). 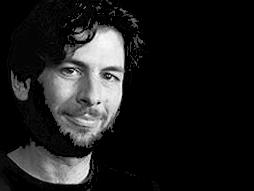 Blaise Aguera y Arcas is an architect at Microsoft Live Labs, architect of Seadragon, and the co-creator of Photosynth, a monumental piece of software capable of assembling static photos into a synergy of zoomable, navigatable spaces. Blaise Aguera y Arcas' background is as multidimensional as the visions he helps create. In the 1990s, he authored patents on both video compression and 3D visualization techniques, and in 2001, he made an influential computational discovery that cast doubt on Gutenberg's role as the father of movable type. He also created Seadragon (acquired by Microsoft in 2006), the visualization technology that gives Photosynth its amazingly smooth digital rendering and zoom capabilities. Photosynth itself is a vastly powerful piece of software capable of taking a wide variety of images, analyzing them for similarities, and grafting them together into an interactive three-dimensional space. This seamless patchwork of images can be viewed via multiple angles and magnifications, allowing us to look around corners or "fly" in for a (much) closer look. Richard Rosenblatt, who sold MySpace to Rupert Murdoch (News Corp), is a real people behind Web 2.0. He raised $320 million to build Demand Media into the next Web conglomerate. Richard Rosenblatt is along with the first person who invented Web 2.0. His vision for the future of the Internet as a unique platform that leverages cutting edge, user-driven publishing, community, and monetization tools as it seeks to define the next generation of new media companies. Richard has built, operated, and sold over $1.3 billion of Internet media companies. Most recently, he served as Chief Executive Officer of Intermix Media, Inc. and Chairman of Myspace.com. Joining Intermix in March 2004, Richard led a successful turn-around of its existing business, helped the management team grow Myspace.com from an unknown web site to one of the most popular properties on the Internet, developed a number of new Internet media properties, and significantly increased shareholder value. During his eighteen months as CEO of Intermix, its public market capitalization grew from $70 million to over $650 million, when it was acquired by News Corporation in October, 2005. In 1999 -the same year with Kevin Ham started his domain business -, Richard sold iMALL, a company he founded in 1994 and served as Chairman and CEO, to Excite@Home for $565 million. iMALL's success was due to an early recognition of the power of user generated content. iMALL offered users a suite of tools which enabled them to build their own eCommerce stores and transact commerce over the Internet. In addition to these two public Internet companies, Richard has been actively involved in a number of private internet companies. He also serves as non-executive chairman of iCrossing, a leading digital and natural search firm. Richard is a Southern California native, with a B.A. from UCLA and J.D. from USC Law school (class of 1994). He is married with three children and a very energetic man. Drink 5 glass off coffe and you'll understand what's Richard Rosenblatt like. He's about 40-year-old entrepreneur that answers multiple phone calls and can keep instant message chats going at once. He started his first company in college, launched five more since. Most of his attention these days is on spending the $320 million he has raised to build his new company, Demand Media, into the next online media conglomerate. The company's 300 employees are in an office building four blocks from the Santa Monica pier. There's good karma. It's the same building where Rosenblatt was chairman of MySpace, which he sold along with its parent company, Intermix, to News Corp. in 2005 for $650 million. Demand Media is becoming the Web's largest social network of hobbyist sites, where professionals and amateurs can write how-to articles or post explanatory videos. Soon they will share advertising revenue. If a popular topic is missing, Demand will pay someone to create a video or article about it. "There is nothing else like this," he boasts. "It's as big an idea as MySpace ever was." Demand also owns Enom, the world's second-largest domain registrar after GoDaddy.com, with an inventory of 9.5 million Web addresses. Demand's domain portfolio brings in another 25 million visitors a month, says Rosenblatt. Enom provided Demand with thousands of "parked domains," generic destinations such as translation.com, gardening.com and map.com. Most of them have nothing but ads and come up only when people enter the site names in a browser's address bar. Rosenblatt plans to ship them relevant articles and videos from his hobby sites to give visitors a reason to stick around and view more ads. The money that Demand has raised from such firms as Oak Investment Partners and Goldman Sachs puts it in the Internet big leagues. Rosenblatt's last financing round--$100 million in mid-September--valued the company at $1 billion, twice its value in the round prior. He expects to gross more than $100 million this year, half of it from ads and half from subscriptions and domain rentals. Earnings before interest, taxes and depreciation could reach $30 million. Rosenblatt has acquired most of his sites on the cheap, but you get what you pay for. Until Demand overhauls them, most of the sites are nothing to look at and bring in fewer than a million unique visitors a month. Ehow, the biggest, brings in 3.5 million visitors a month, according to ComScore Media Metrix. That's not even a tenth of what the New York Times Co. gets out of About.com. Ethan Hall, who runs operations at Web retailer Hustle Paintball, spends nearly twice as much on ad buys at pbnation.com, the number one paintball fan site, as he does on Demand's pbreview.com. But Rosenblatt has the energy to take on all comers. "People think I'm all show, no go," he says. "Throughout my career no one ever believed that what I was working on was going to be big. I have to re-prove myself every time." Rosenblatt grew up in California's San Fernando Valley, the son of a nuclear physicist dad and a professor mom. As an undergraduate at ucla he started a firm that placed ads in small newspapers. He kept that going, got married at 23 and indulged his parents by getting a law degree in 1994 at the University of Southern California. But legal work bored him, and he quit after six months. A few months later Rosenblatt invested in a Web domain-name reseller called Great Domains. It was sold a year later to VeriSign for $100 million. In September 2000, Rosenblatt took the job of interim chief at Drkoop.com, a health information Web site that was losing $6 million a month. Bad career move. Despite deep cuts, the business couldn't survive the tech recession. Drkoop.com filed for bankruptcy and shut down in December 2001. "I was very uncomfortable doing anything big after that," he says. In 2002 he opened a nightclub in San Diego (the first of four, all of them named Air Conditioned) and helped launch a fantasy Web site called Superdudes, a social network in which people create cartoon avatars. It got 1 million members in six months. In November 2003 he got a call from a founder of a group of sites called euniverse to take over as chief. The company was losing $4 million a quarter and had delisted from Nasdaq. Still, Rosenblatt wanted in. "I figured, if I fail again, I'm done. But if I succeed, I can do whatever I want for the rest of my career." Then-chairman David Carlick, managing director at VantagePoint Venture Partners, was sold on Rosenblatt. "The world is more charged, the sun is brighter when he is in the room," he says. But the board was nervous. "They thought he was a surface guy. They didn't think he was deep enough to be the ceo," says Carlick. But he aced the Myers-Briggs personality test they made him take, and he became chief in February 2004. He renamed the company Intermix, nixed half a dozen failing businesses and gave MySpace Chief Chris DeWolfe free rein and more resources. MySpace grew from 1,000,000 members to 24 million by October 2005, when Rosenblatt sold Intermix to Fox for $650 million--an eightfold increase from the company's value on day he arrived. Rosenblatt walked off with $23 million. After the sale Rosenblatt received a call from Shawn Colo, a buyout investor he had met earlier that year. Colo pitched him his idea of a roll-up of Web sites and parked domains. Rosenblatt thought it would be even more explosive if they added social networking, and they started looking for things to buy. They recruited a handful of executives from Yahoo, InterActiveCorp and Intermix and lined up two key acquisitions: Enom and Ehow. They pitched their creation to a group of potential investors, including Fredric Harman at Oak Investment Partners, in May 2006. When Harman had met Rosenblatt a few months prior, "he came across as a slick, fast-talking entrepreneur," says Harman. "But by the end of the meeting I concluded that whatever he wanted to do next, I wanted to back him." Oak has put in a total of $126 million in Demand for a third of its shares. Rosenblatt used some of the money to buy back 20 sites from Fox, including casual gaming networks Myleague.com, Casesladder.com and Grab.com, for an undisclosed sum. "They thought it was junk," he says, a bad fit with MySpace's young audience. But by adding social-networking tools like chat and personal profiles, Demand has tripled the amount of time users spend on Grab.com, visited mostly by women ages 25 to 55. Demand's size allows it to get better terms on ads served up from the likes of Google, Yahoo and Vibrant. After Demand bought ExpertVillage.com, it tripled the rate it gets on in-text ads. Demand hired its own ad sellers a month ago who have sold space to the Texas state lottery, Lions Gate Films and Paramount Vantage. The idea is to share the wealth to get more people posting content. Demand pays filmmaker Kyle Saylors $300 to produce 15 two-minute clips on how to win beauty pageants, perform motorcycle stunts and do magic tricks. They run on ExpertVillage.com. Saylors has made more than $20,000 from the site. In mid-September Rosenblatt introduced Demand Studios to recruit professional writers and filmmakers like Saylor, and will offer them a percentage of Demand's ad revenue. Demand's engineers cooked up an algorithm that predicts which subjects will make the most money based on the popularity of phrases in search requests and topics to which advertisers say they want to be linked. "I thought, it can't be that easy," he recalls. "So I talked to some domainers, and they said, 'We own 300,000 domains, we make $20 million a year, we have just four employees and some servers in the Caymans.' I thought, 'If you can make that much doing nothing, what if we added some Web 2.0 sprinkle so that people would come back - user publishing tools, social networking? What if we built a platform where we could snap that into as many domains as we wanted?' That's when the lightning bolt hit me: You'd have a company that generates its own traffic, generates its own content, and monetizes itself. It would be the perfect lazy-man's media company!" Maybe the differences between him and Kevin Ham is that he's more focussing in really good domain names, as Kevin Hams is buy 1000 domain names at once. No body until Business 2.0 magazine and later cnnmoney digg the story about him, 37 years old and humble man, know him. Silently he own the internet in his own way : building 300.000 domain empire and monetizing it. Since 2000 he has quietly together a portfolio of some 300,000 domains that, generate an estimated $70 million a year in revenue. Kevin Ham is a medical doctor by profession and a graduate of the University of British Columbia. 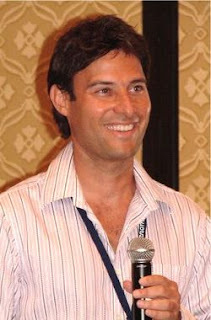 Kevin Ham entered the Internet in 1999, when he founded his first domain business HostGlobal.com, a webhosting review directory. Along side with DNSindex.com, his two small Web ventures were pulling in more money in a month -- sometimes $40,000. A year later, Kevin formed Reinvent Technology, Inc media group of companies, and today the group has offices in Vancouver, Canada and Barbados. And after seven years of exponential growth under Kevin’s leadership, Reinvent.com has become a global media and technology company. The company’s IP, technology and media arms work together to connect the hearts and souls of people around the world through words and visuals. Kevin is heading up several initiatives to become a dominant presence in the Web 3.0 Semantic Web, the advertising industry and local space, trying to reinvent media. A self-learner programmer, designer and businessman, Kevin has become a principal professional in the domain name business, where he enjoys the reputation as an innovative online media space leader with few equals. (Name it : Yun Ye, Scoot Day, Garry Chernoff, Frank Schilling, and Richard Rosenblatt). Through Reinvent he is leveraging new technology, ideas, human and intellectual capital to transform this direct navigation enterprise into a cutting edge, global media company. The business of Reinvent is centered on the most powerful and intelligent domain portfolio and technology platform in existence today. Kevin Ham has looked for every opening and exploited every angle -- even inventing a few of his own -- to expand his enterprise. Early on, he wrote a perl script software to watch expiring names on the cheap. He was one of the first to take advantage of a loophole that allows people to register a name and return it without cost after a free trial, on occasion grabbing hundreds of thousands of names in one transaction. All sites receive 30 million unique visitors a month. And it's really easy to get one of his web pool, type directly in address bar from your browser, and type it like www.something.cm ( not .com), and you'll landed at one of his portofolio. What's new about his strategy that he, If he bets right, "If you control all the domains," he says, "then you control the Internet."